In the beginning there was Spacewar! and it was good. The very first video game set forth its simple controls, consisting of rotate clockwise, rotate counterclockwise, thrust and fire, and that was plenty for the computers of the 1960s. Eighteen years after Spacewar! was created came Asteroids, which spawned a huge number of clones in the arcades of the 80s, and then not a whole lot happened afterwards. Every once in a while the control scheme is brought out for an Asteroids-style tribute, but Spheres of Chaos is still unbeaten in that particular genre. 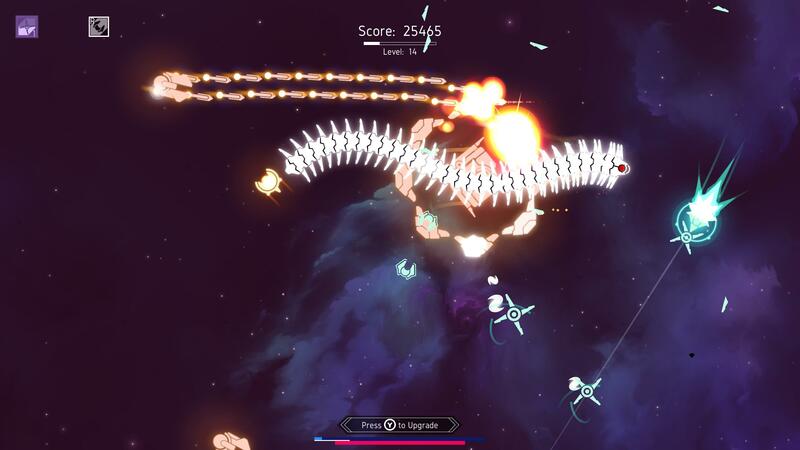 That doesn’t mean there aren’t other things to do with the format, though, and that’s where the pure arcade shooting throwback Nova Drift comes in, fusing the Asteroids controls with the enemy variety of a twin-stick shooter in a modern mini-roguelike format. Like the best of the arcade it doesn’t really matter why the enemy ships are attacking. The important thing is that they are and you need to blow them up before they do the same to you. It all starts simply enough, with flat black asteroid silhouettes gently drifting across a beautifully-painted starry background, and you dispatch them in the usual style. Rotate, thrust and fire to clear the board, and flying off the border of the playfield sees you instantly returning from the opposite side. 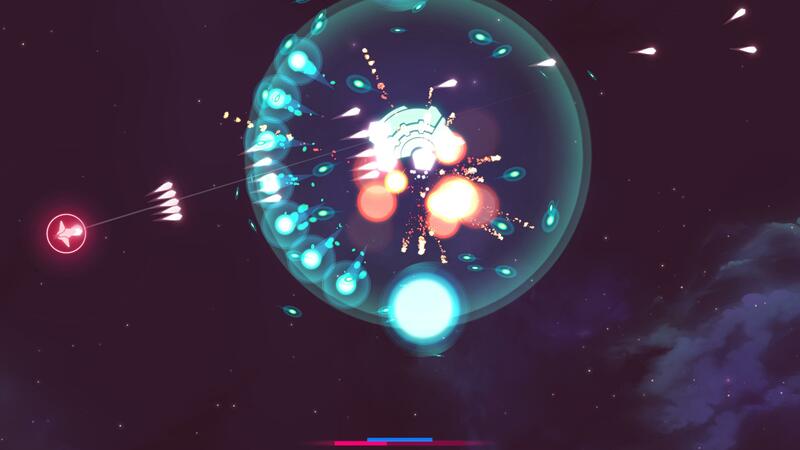 Once the asteroids are gone, though, the enemy ships start attacking, and everything starts to happen all at once. The enemies of Wave 2 aren’t particularly threatening, of course, but they do drop twinkly little sparks that home in on your ship. Those sparks are experience and the first one you get instantly grants a level-up. The first three levels are pre-set in terms of what type of upgrades you’ll get, with the first being weapon, the second hull-type and the third shield, and how you mix and match the pieces together determines what kind of run you’ll play. The Assault body is, as its name implies, a direct attack vehicle, matching up nicely with just about any weapon you put on it. The Sentinel, on the other hand, gets bonuses to its shields, so you’ll probably want a weapon that’s easy to handle while choosing something like the flame shield, which damages any enemy in its radius. Once you’ve earned them all there are eight different hulls to pick from, each handling differently and focused on its own strengths and weaknesses, so with a bit of experience you’ll learn which aspects to focus on. The Engineer and Architect may both be focused on building constructs such as drones, mines or AI fighters, but the Architect can only build one very powerful unit at a time as opposed to the Engineer’s swarm so the decisions on base gear are very different. Once you’ve settled on the initial loadout, which only takes a few waves’ worth of enemies to earn, Nova Drift pulls out the stops and throws out everything, seven options at a time. Each new level lets you choose from one of seven randomly-selected upgrades, each of which is part of its own four-item tech tree. Adding or enhancing explosions to your gun opens up a pair of options that might show up in the next level-up, one of which makes the area of effect bigger while the other shrinks it down but increases the damage. The two aren’t mutually exclusive so if explosions are a focus you can fill in the whole tech tree over the course of four level-ups, ending with a Rupture skill that causes enemies to explode and can make a lovely chain reaction. Certain tech trees have to be completed before others open up, such as Advanced Engineering leading to a choice of creating Assault or Defense drones. 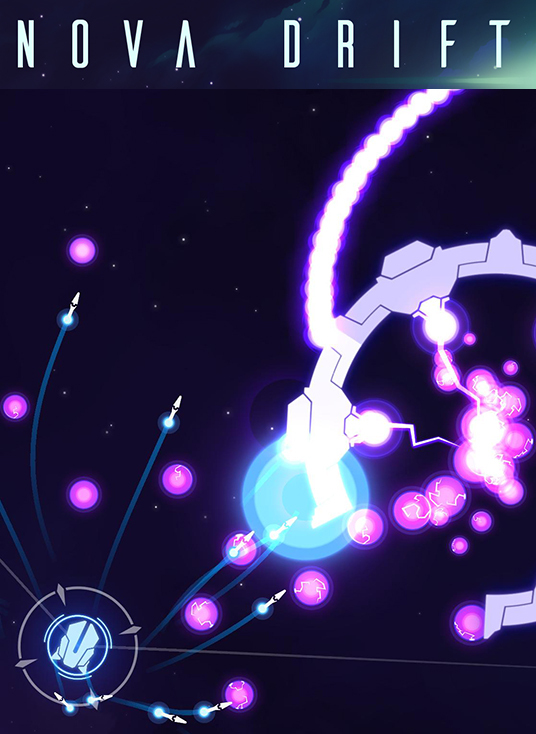 It can be a lot to take in all at once but Nova Drift simplifies the learning process through a series of unlocks, using each run’s score to fill in an overall ranking that rewards you with a variety of upgrades including new ship types, weapons and shields, plus options to ramp up the difficulty in exchange for faster leveling up capabilities. All those skills and options need enemies to use them on, and thankfully there’s no shortage in both number and type. Little popcorn ships go down in a few hits, large-ish enemies dart around the screen firing in unpredictable patterns, supply trains wander by posing no threat but filled with experience drops, mine layers dart straight for you while leaving a dangerous trail in their wake, and bosses both maxi- and mini- show up to keep you on your toes. The giant rotating space station armed with lasers and multiple types of bullet patterns takes a bit of figuring out, but the elite enemy that starts with a shield that counterattacks when hit while the central mass throws out massive plasma balls that sit there taking up valuable screen space while the core needs to be shot down piece by piece is a real problem. It’s tempting to focus on offense, whether that be guns or helper-bots, but while the standard enemies go down in a hit or two there are enough of them and they attack aggressively enough that even the little guys can get off a shot or two if you’re not careful. What makes Nova Drift work so well is how it takes the classic Asteroids format and gives you room to not just shoot everything down but find your own way to do it. All about offense? The Sentinel is nice but maybe ramming things with the Hullbreaker is better than simple shooting them, although you’ll want to balance shield and hull upgrades with a weapon perk or two to avoid overdoing it. Feeling sneaky? The Stealth ship fades to invisibility when not firing or moving, lending itself to powerful hit and run strikes. Even with a good build made up of a clever selection of complementary perks there’s no guarantee of a high score, because there’s an enemy in the spaceship menagerie that’s perfectly suited to take you apart if you’re not exceptionally careful, and that’s not counting the occasional wandering black hole or comet. Those hazards are indifferent to the struggle of a righteous spaceship against a vicious enemy horde, though, so with a little and luck and nimble maneuvering they are just as helpful as they are dangerous. Nova Drift is a big, endless, beautiful universe of arcade combat, fusing the modern indie gaming style with the deepest roots of gaming history.